Join high school juniors and prospective transfer students from across the country at this can't-miss-event! Sooner Saturday is our largest open house of the year with a full day of exploring OU and all it can offer you as a future Sooner! Follow OU Admissions & Recruitment on Facebook, Twitter, and Instagram to stay up-to-date on all things Sooner Saturday, from when registration opens to fun giveaways! When registering for Sooner Saturday, you build your own schedule! Among your many choices will be a chance to tour campus or select open houses for programs around OU to see the places where you’d spend time as a Sooner. Our main campus is very walkable, and we take a lot of pride in its beauty! Build Your Schedule When Registering! 8:30 a.m. - Doors Open to McCasland Field House for Trivia, Giveaways and More! 9:50 a.m. - 10:30 a.m. - Student Mix N' Mingle with Student Organizations, Snag a Snow Cone (or Coffee) and More! OU offers students more than 170 excellent majors to choose from, even providing options to build your own degree to best fit your interests and career goals. Several of our programs are nationally ranked, so whatever academic path you choose at OU is sure to be a great one! OU students are the happiest at any public university in the nation, according to the Princeton Review. With more than 500 student organizations, including sororities and fraternities, club sports and intramurals, religious organizations, and career-focused groups, you’re sure to find people who share your interests. You can even start your own organization! I'm a College Transfer, What's Next? I'm from a Small Town, What's Next? Student Panel - What's OU Like? From research opportunities throughout all our academic programs to free resources available at the Innovation Hub, OU encourages students to explore and expand their worlds. OU values innovation, and students have access to research opportunities as soon as they step on campus! All times 1:00 p.m. to 3:00 p.m. unless listed otherwise. Couch Restaurants - 1:30 p.m. - 2:15 p.m.
Starbucks in the Union - 7:00 a.m. - 11:00 a.m. Chances are likely that no matter what time of year it is, there’s an OU athletics event going on! We have some renowned athletics programs at OU, and there’s nothing like the spirit and atmosphere of one of our games. As a student you only have to pay for football and men’s basketball tickets, and everything else is free with your OU ID! Registration for Sooner Saturday is free and includes all programming as well as lunch for the registered student. Additional guests will have the opportunity to attend lunch in Couch Restaurants at a discounted rate of $5.00. At OU, we don’t just talk about the Sooner family – we embrace it and believe it is part of what makes the University of Oklahoma special. We are all part of one community, and we value the different backgrounds and perspectives our students bring into the fold of the Sooner family. We'd love for your family to join you at this event! Please click below to book your hotel room. Each hotel is offering a special rate for Sooner Saturday guests. Check-in will be held in McCasland Field House. 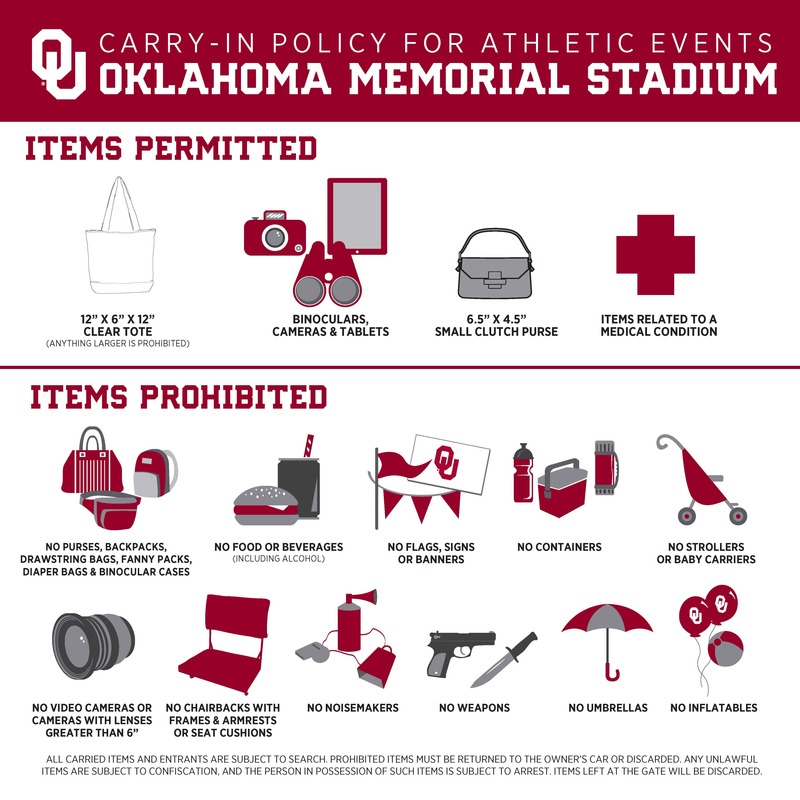 If it rains or weather is inclement, check-in will be moved underneath the Oklahoma Memorial Stadium. Guests will be notified via email if the check-in location changes. Click here to see the campus and parking map. 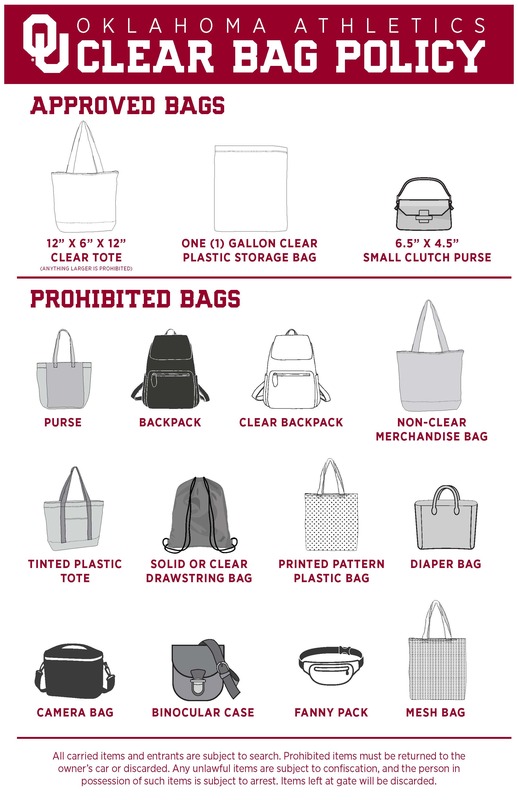 OU has implemented a clear bag policy for our large venues on campus, including McCasland Fieldhouse where the event will begin. Please review the Carry-In Policy and Clear Bag Policy. When registering, let us know of your (or your family member's) physical need so that we may accommodate you and your family at the event. Spanish speaking translators will be available at Sooner Saturday. When registering, let us know that your family's primary language is Spanish. As the event occurs on a Saturday, you will not need a permit to park on campus. All OU lots are available for your use and will be staffed with current students ready to welcome you! Parking lots are highlighed on this parking map. (PDF). To receive emergency text alerts while on OU's Norman campus, text "OUSooner" to 67283. Texting “OUSooner” to 67283 enrolls your cell phone number in OU Alerts for the OU Norman campus. Once enrolled, you will receive any emergency text messages sent the day of your enrollment. Your cell phone number will be automatically removed from OU Alerts after 24 hours. If you need to enroll your number for another 24 hours, follow the same steps as above. Norman is a vibrant college town, a community that embraces the university. Known as the City of Festivals, there are always interesting events like the Norman Music Festival or Medieval Fair for students to check out. Downtown Oklahoma City is also just a 30-minute drive away, giving Sooners close access to city life and all that has to offer. Norman is home to the National Weather Service, providing the best weather awareness across the country! Before Sooner Saturday, we’ll keep you posted on whether to bring a rain jacket or sunglasses! We'll keep all registered guests up-to-date on any weather, but you can check the local weather for Norman, Oklahoma at weather.com and locating our zip code (73019) or by following @OUEmergencyPrep on Twitter. OU offers endless possibilities for your college experience, and we are so excited to introduce you to some of those on Sooner Saturday. We can’t wait to see you on April 27!